Fely Sicam, author of the viral "Are resident doctors really doctors?" article, is depressed for being a target of character assassination. 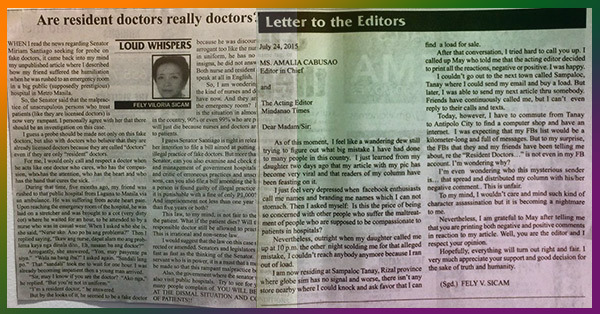 The columnist has been in hot water for a week now after a netizen posted a snapshot of her article published by the Mindanao Times, which is about an experience she encountered when a friend was rushed to a public hospital in Manila. It was the news about Senator Miriam Defensor Santiago seeking for probe on fake doctors that motivated Sicam to express her views on issues pertaining to the illegal practice of medicine and "dismal situation and conditions of patients" in some of the country's hospitals. Sicam claimed she met an arrogant nurse and resident doctor she thought was "fake" for not wearing an ID and uniform, for having no name tag or insigna, for being discourteous, and for not speaking in English. As the post went viral quickly, OBGyn Alexander Tan Jr. wrote a response to refute Sicam's "egregious statements." This is in response to an opinion piece titled “Are resident doctors really doctors?” written by Fely Viloria Sicam. There are some egregious statements which I would like to refute. 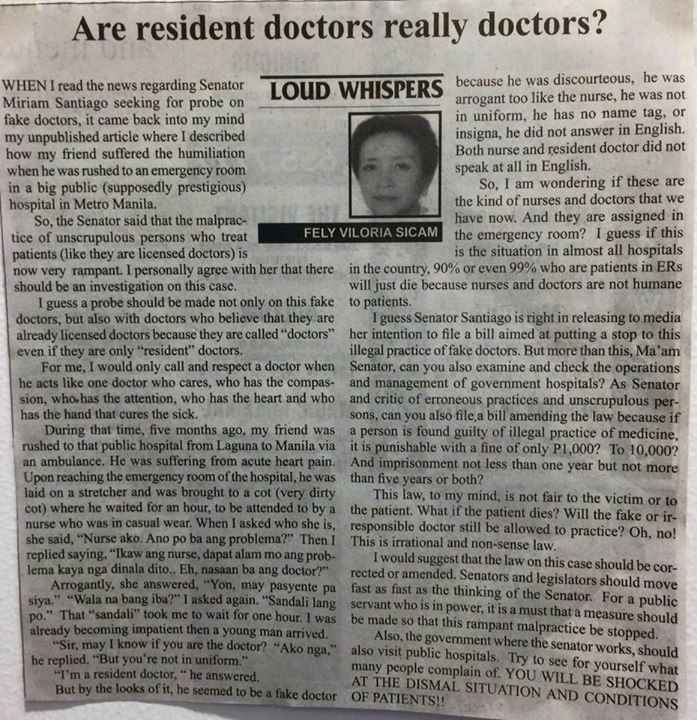 She writes “I guess a probe should be made not only on this fake doctors, but also with doctors who believe that they are already licensed doctors because they are called “doctors” even if they are only “resident” doctors.” This displays a complete lack of understanding of the hierarchy in medicine. Resident doctors are general practitioners who have embarked on a training program in his/her chosen specialty. They are licensed doctors. One also has to take offense at the use of the word “only.” This belittles the hard work needed to achieve the position of a “resident” doctor: (1) a bachelor’s degree (4 years), (2) a doctor of medicine degree (4 years), (3) internship (1 year), (4) pass the board examinations (this confers the license to practice medicine and the title of general practitioner), and (5) pre-residency (anywhere from 1-3 months). In truth not all doctors are lucky enough to enter/finish residency. Some remain general practitioners for life but this doesn’t mean they are less deserving of one’s respect and the right to be called “doctor.” Lest you think residency is easy think again because it takes anywhere from 3-5 years. After residency there’s specialty board examinations. For the very motivated few there’s subspecialty training which can take 1-3 years. You might notice that I’ve emphasized the decades spent trying to learn the art and science of medicine. It is a lifelong commitment. General practitioners, residents, fellows, consultants, specialists, subspecialists­ – we are all doctors and we are all licensed. She writes “For me, I would only call and respect a doctor when he acts like one doctor who cares, who has the compassion, who has the attention, who has the heart and who has the hand that cures the sick.” This presents a very narrow and limited concept of a doctor. Some doctors are on the fringes of patient care. There’s the pathologist who cuts and studies the specimen submitted by the surgeon. There’s the radiologist who reads x-rays. These doctors spend very little time in direct patient contact but nevertheless they perform a very essential part of patient care. They have practically no opportunities to show the “compassion, attention, heart and the hand that cures the sick” which seems to be a prime requirement to be deemed worthy of being called and respected as a “doctor” in Ms. Sicam’s eyes. She writes “When I asked who she is, she said, “Nurse ako. Ano po ba ang problema?” Then I replied saying, “Ikaw ang nurse, dapat alam mo ang problema kaya nga dinala dito. Eh, nasaan ba ang doctor?” This exchange suggests a lot of things: (1) the nurse is trying to do her job by taking a history which is always the first part of patient care, (2) the nurse is trying to maintain respect towards the patient’s companion by using “po” and (3) Miss Sicam displays her arrogance by replying “Ikaw ang nurse, dapat alam mo ang problema, ….” A paragraph later she bemoans the fact that the “sandali” took an hour. Again this displays an ignorance of the concept of “triage.” An emergency room doesn’t operate on a first come, first served basis. Triage is the medical term that describes the technique used by emergency room doctors when they have several emergencies at the same time. To save the most lives, doctors separate patients into groups: those who require immediate medical attention, those who will die regardless of intervention, and those who can afford to wait a little while. The routine patients are left until last. Either way all patients will be attended in due time. This system holds true whether in a government hospital, private hospital, clinic, lying-in, in short -- everywhere. The doctor makes the judgment when a patient should be attended to (not the patient and certainly not the patient’s companion). She writes “’Sir, may I know if you are the doctor?’ ‘Ako nga,’ he replied. ‘But you’re not in uniform.’” Miss Sicam then goes off to conclude that the resident is a fake doctor because “he was discourteous, he was arrogant too like the nurse, he was not in uniform, he has no name tag, or insigna [sic], he did not answer in English.” With all due respect, a uniform does not make a doctor. I can remember times wherein I had to rush to the hospital wearing casual clothes in order to deliver a baby in my role as an obstetrician. Needless to say wearing the proper “uniform” is the least of my priorities in those emergency cases. I have a colleague who’s wearing trunks and was just enjoying swimming on the beach when somebody almost drowned. Thankfully he was there to save the day. What this means is that our attire has very little to do with the way we perform our jobs. Like any other doctor I love the dignity bestowed by wearing my blazer/long coat but I have no problems dispensing with it in emergency cases. As a doctor I am well aware that communication is an important part of therapy. The patient must understand the correct way of taking medications. The patient must be able to follow advice regarding his current condition. As a practicing physician for 10 years I’ve had to tailor my language according to a specific patient’s needs. I’ve had experience talking to patients from all walks of life: children, adults, educated, uneducated, literate, illiterates, etc. This means that I always have to translate medical jargon in layman’s terms. This is something that holds true for each and every patient. There’s no sense in talking in terms the patient cannot understand. Most Filipinos know how to speak English but this doesn’t always mean it’s the best way to communicate with our patients. And neither is it required for that matter. In most cases our national language works just fine. Maganda ang wika natin; dapat lang nating gamitin at pagyamanin ito [Our language is beautiful; we must use and enrich it]. She writes “I guess if this is the situation in almost all hospitals in the country, 90% or even 99%, who are patients in ERs will just die because nurses and doctors are not humane to patients.” Where did that 90% come from? Do you have the mortality reports from the hospitals to back up your assertions? I will cut this piece short by saying how deeply offensive this opinion piece is. If it purports to the lofty goals of journalism then it is a dismal failure. The mere fact it was published says a lot. It is (in the words of Renata Adler) simply, jarringly, piece by piece, line by line, and without interruption, worthless. I AM SHOCKED AT THE DISMAL SITUATION AND CONDITION OF JOURNALISM IN OUR COUNTRY!!! Doc Lexie's post has been featured in blogs and shared via social media the past few days. I am an Internist and not so long ago i was also a resident physician and i take offense from this article. Please get your facts straight before publishing. Although it would be exceptional to be well versed in the international language, I dont think it was ever required for medical personnel Doctor , nurse or the like to be english proficient in order to practice their professions. And based on your article may i also point out that given the benefit of the doubt on the manner and tone of how the staff asked you, you answered them in a condescending tone. With all due respect , why of all places would you expect an english speaking staff from a government hospital?? Which country are you from? Really?? Even tertiary hospitals use the vernacular language to converse not unless we are dealing with foreign, non filipino patients or visitors. If you can understand the vernacular why would we prefer speaking a foreign language not unless the message we want to convey has no translation in the local language. So how are we supposed to deal with our common, minority and indigent patients when they come for consult ? Doesnt makes sense does it? Residents are licensed doctors, they will not be allowed to practice in medical institutions or even practice the art of medicine if they didnt have licenses to begin with, because it will compromise not just the care of patients but also even the the credibility of the institution that employed them. And also despite having licenses , they are also under the supervision of their senior residents, consultants and senior staff members. Maam even volunteer medical staff personnel are required to be board passers of their respective fields for them to be able to operate within a medical institution. Throwing the question back , Are these the kind of journalists we have nowadays?publishing articles recklessly without researching (not generalizing). Do "REAL JOURNALISTS" get qualifying examinations before they get to write these columns? Do you take Board examinations or get certified by a Professional Regulating Body? I stand corrected if not , but when you asked are these the kind of nurses and doctors we have now?..... These Doctors and even nurses youre referring too are Double Degree Holders and most of them passed not one but at least two professional board examinations and completed several means of training to get to where they are. So qualification wise no question asked. they know what they're doing, my question is how qualified or what qualifies you to to write this article and pass judgement on my medical colleagues or even judge their standard operating systems ? Do you even know what you are talking about ? Did you even bother to research or inquire how we operate? You did not disclose in your column , despite the incident , didnt the medical staff manage the patient ? there were delays as expected but wasnt she attended to at some point? So isnt omitting that part make the story incomplete? what happened to the patient? did she survive ? And If the case of the patient was as urgent as you described, why the long travel from Laguna to Manila? You should have brought your patient to the nearest hospital so she can be attended to the soonest. This article is reckless and irresponsible , Clearly Maam you havent thought this through when you were writing it, i cant even imagine how your editor in chief allowed/approved such article to be published. As far as i know journalism should be reported with facts , without biases and with substantial research and evidences to make a story plausible. You cant just write anyhing that comes to mind , as a journalist you have to be objective and not subjective in writing your articles cause im sure even real Journalists follow a certain guideline or protocol when publishing or writing for a paper. Your doctors and nurses are human beings not machines , they can only do so much with a pair of hands, especially when the ratio of patient and medical staff is overwhelming, when the demand is greater than the supply which is the usual picture in public hospitals, they can only do so much at a time , when every patient needs something from a limited pair of hands every single minute and each request wants to be attended to immediately. And finally maam please also be considerate of the doctors and medical staff, please dont be condescending of the people that are there to help you ; being part of the system is difficult all along , they too sacrifice a lot to be able to cater to the needs of patients (e.g. skip their meals, a maximum of an hour or two of sleep during their 36 hour shifts , prepare a conference report infront of the department the morning after your sleepless duty where you get drilled with questions by your seniors regarding your management of the patients you handled, having no regular or special holidays missing out on time for themselves and loved ones and most of the time missing out on family affairs, now if that is not care and concern for patients who are not one bit in close relation to us but are there to attend to you no matter how you treat us, then i dont know what is) and if that's not enough besides the individual complaints of the patients they have to deal with personalities like yours , endure attitudes like yours , get reprimands from their seniors and consultants despite being food and sleep deprived (God bless you people who get a full 9 hours of sleep, and eat three full meals with snacks in between on time!youre blessed!) yet manage to keep a straight face when they tend to your needs. Being part of a medical staff is difficult down to the core Physically, Intelectually and Emotionally! I hope this letter will enlighten you to how it is to be a doctor nowadays. P.S. im speaking in english that must mean im a real doctor ? Until today, Dr. Enerva's open letter is still spreading on Facebook like wildfire. On the other hand, Titus Abrasax a.k.a. Marty Soroan had a follow up post about Sicam, this time a snapshot of the writer's July 24 letter to the editors of Mindanao Times. 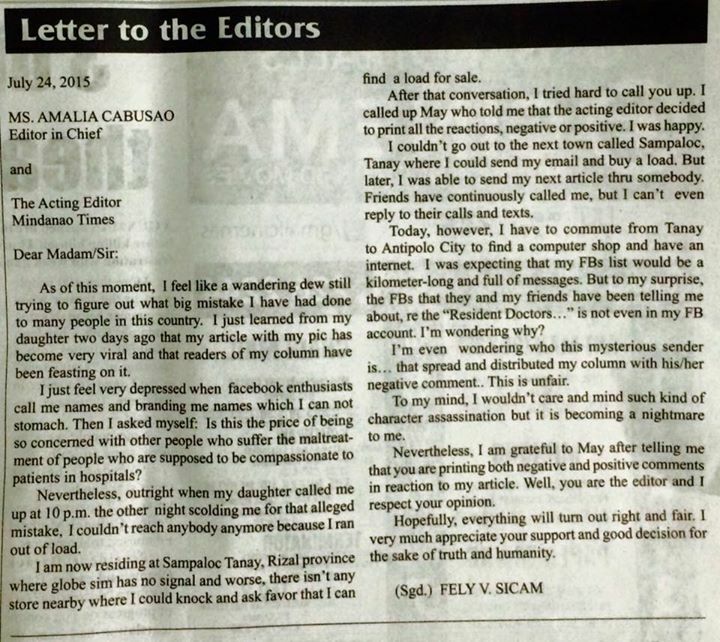 In her letter, the columnist admitted that she still has to figure out what her "big mistake" was for having been called and branded by "Facebook enthusiasts" with names she "cannot stomach." Sicam said she asked herself if all the flak was her "price of being so concerned" to people "who suffered maltreatment" from people—nurses and doctors, apparently—"who are supposed to be compassionate to patients in hospitals." The columnist said she hopes "everything will turn out right and fair." Titus, however, asked if Sicam's letter was a "diary" written with "paawa effect."